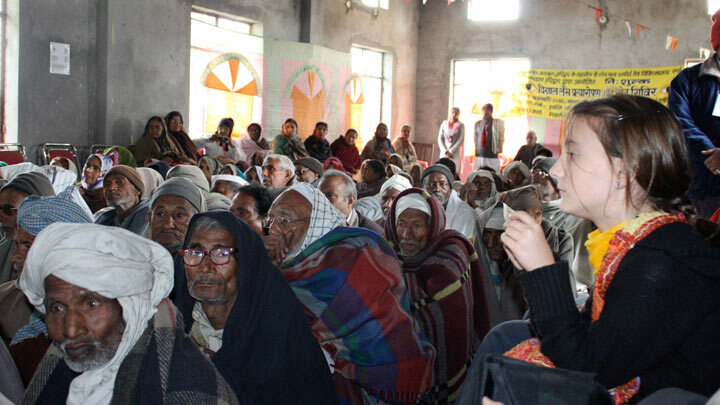 Three times a year Shanti Mandir’s global resources are mobilized to organize eye camps in northern India, where people with eye diseases receive treatment. The eye camps are arranged through the Shanti Mandir ashram in Kankhal, next to Haridwar in Uttarakhand State. Shanti Mandir sponsors the eye camps in association with GMC Eye Hospital, Haridwar. Since 1998, 28 free eye camps have served more than 18,300 men, women, and children. Each patient is examined and either prescribed medication or glasses or asked to return for surgery the following day. To date, 3636 patients have undergone successful intraocular lens (IOL) surgery to remove cataracts and restore vision. The patients receive free meals, consultation, medication, and transportation to the hospital for surgery. In each eye camp organized by Shanti Mandir and overseen by Swami Nityananda, great care is taken to ensure a consistently high standard of service in the areas of surgery and postoperative care. The success rate of all surgery performed to date is 100 percent.